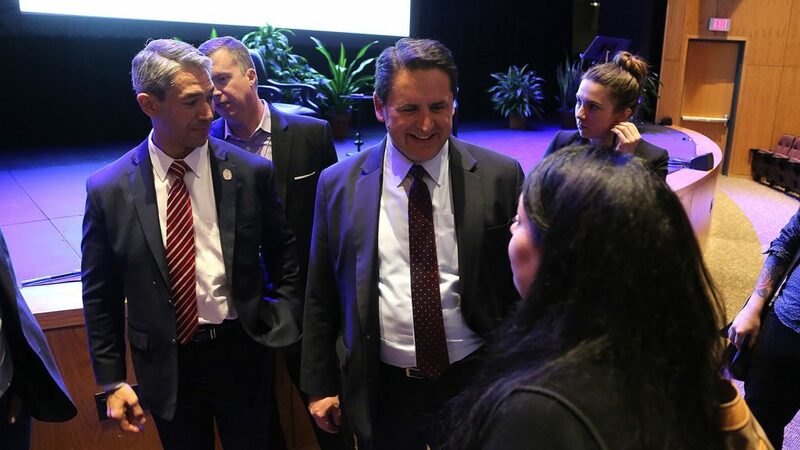 City Manager finalist Erik Walsh, in his first appearance in a community forum setting, spoke on a smorgasbord of issues facing San Antonio on Wednesday night at the University of Texas at San Antonio’s downtown campus. Walsh, a deputy city manager, was interviewed by Maria Luisa Cesar, former staff member with Mayor Ron Nirenberg and CEO of Greater Good Stories public relations firm, who asked questions submitted by citizens via email, social media, and Eventbrite. “I want San Antonio at the top of every list—best place to live, best place to work, best place to raise a family,” Walsh said. More than 80 people attended the forum, including Walsh’s family, friends, several council members, and deputy and assistant city managers, including María Villagómez, who was a finalist for the city manager position. When asked what his top priority would be if was hired, Walsh said: “aligning with the mayor and council’s expectations.” Before dealing with “organizational issues,” he said he must be in “lockstep” with what the mayor and council want. “I think I have an idea of things I want to change, but walking into a job like (being a city manager) with that type of responsibility, you don’t make changes right off the bat,” Walsh said. Walsh said more than $25 million is budgeted for the Affordable Housing Business Plan, a substantial increase from previous years thanks to the Mayor’s Housing Policy Task Force. He mentioned the risk mitigation policy, which is still in its public outreach phase, and the Under One Roof program, where residents in Districts 1-5 can receive a $14,000 grant to repair their roofs, as programs being utilized under the business plan. A question submitted through Facebook in Spanish asked if services to Spanish-speaking citizens would be expanded, and about making city government more inclusive. Walsh said current services should have been done “a long time ago,” and plans to continue working with District 1 Councilman Robert Treviño and District 7 Councilwoman Ana Sandoval, who pushed for language accessibility in the city’s Public Participation Guiding Principles. Walsh commented on the city’s attempt to make city politics more transparent, aligning with Sandoval’s wanting for more public participation in city processes. “There are opportunities to make it easier,” he said, referencing District 9 Councilman John Courage’s usage of social networking app Nextdoor for notifying District 9 citizens of community meetings and construction projects. Walsh said the city is testing Tele-Town Halls, where citizens are called by the city to listen in on meetings. Walsh mentioned a City Council program that gave preference to small, local, minority, and or women-owned businesses to address a question on treatment of contractors working in the city, with 50 percent of city contracts going to those businesses. Regarding the Collective Bargaining Agreement between the city and the firefighter union, which Walsh says he’s asked about “everywhere (he) goes,” he said he’s anticipating negotiation and says it will be resolved. An update on potential cite and release policy, for low-level marijuana possession, was briefly discussed, and which the City Council will hear a briefing on on Feb. 13. The city has discussed the potential policy change with the District Attorney and the San Antonio Police Department. After the forum, Nirenberg said Wednesday’s gathering was a sign of more transparency in San Antonio politics. In recent weeks, District 6 Councilman Greg Brockhouse has criticized the city manager selection process for interviews between the City Council and potential candidates being held in closed sessions. Nirenberg said Walsh will continue these forums and community meetings leading up to Jan. 31, when City Council will vote on his appointment, however a schedule has not been advertised. Walsh’s community outreach will continue after Jan. 31, the mayor said.